I've been noticing panko more on my grocery trips and seeing it pop up in recipes. Since I had never used it before, I wasn't quite sure what it was, exactly. So I finally picked up a package and took a closer look. Oh, it's just breadcrumbs! So what makes them so special? 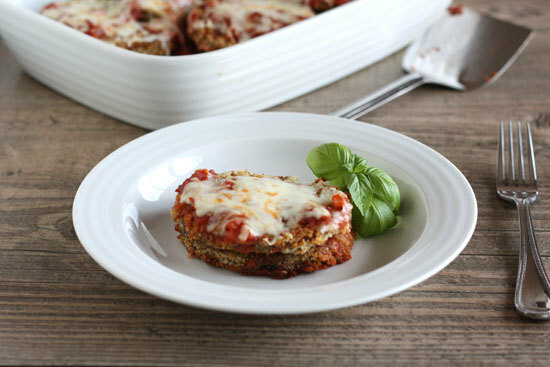 Turns out they make the crispiest, best homemade eggplant parmesan ever! Panko are the Japanese version of breadcrumbs and are lighter and coarser. They also tend to absorb less grease, which make them perfect for my goal of reducing unwanted calories from my dish. If you haven't tried them, I highly recommend you do the next time a recipe calls for breadcrumbs. You may never go back to regular breadcrumbs again! I know I won't. 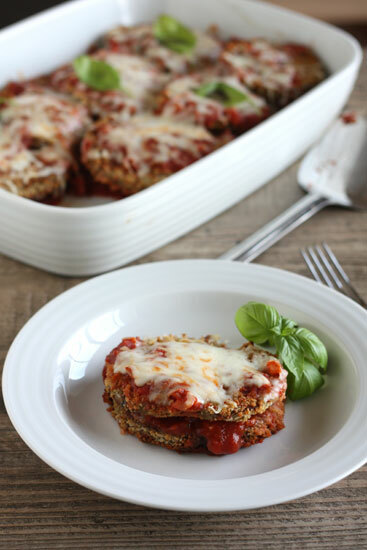 I've tried different ways of making eggplant parmesan. I've skipped the salting step. I've tried it both with and without eggs. Pan frying never seems to get ordinary breadcrumbs to stick well and baking alone never gets it crispy enough. I've never been satisfied with the texture. I finally feel like I've found the answers. This eggplant parmesan recipe is flavorful and has the perfect crispy texture without the extra oil from pan frying. Pair it with a side of pasta and a glass of red wine and you'll be good to go! And don't forget the bread! Our Pane Bianco Italian Bread Recipe would be the perfect accompaniment to this Sunday Supper. Peel and slice the eggplant into 1/4 to 1/2 slices. Place them on a cooling rack over a baking sheet and sprinkle them with salt. Allow them to sit for at least 30 minutes for the bitter juices to drain out. Prepare the sauce while waiting. Place the oil in a saucepan over medium heat. Add the garlic and crushed pepper and cook until the garlic lightly browns. Add the onions and cook until they become translucent. Add the tomatoes, sugar, oregano, and basil. Bring it to a boil and then simmer for 10 minutes. Add salt and pepper to taste. Preheat the oven to 425 degrees F with a baking sheet inside. Rinse and pat dry the eggplant slices. Combine the breadcrumbs with 1/2 cup of Parmesan cheese. Place the flour in a dish, the eggs in a shallow bowl, and the breadcrumb mixture in another dish. Dredge each eggplant slice in flour and then in the eggs, letting the excess drip. Coat with breadcrumb mixture and place them on a cooling rack. Remove the baking sheet from the oven (do not turn off oven) and brush 3 tablespoons of oil over the entire hot baking sheet. Lay the eggplant slices on the baking sheet. Bake for 30 minutes, flipping the slices over after 15 minutes. In a 9 by 13 inch casserole dish, spread 1 cup of sauce. Layer half the eggplant slices over the sauce. Cover with another cup of sauce and sprinkle with 1/2 cup mozzarella cheese. Add a second layer of eggplant and cover with another cup of sauce and 1/2 cup mozzarella cheese. Bake for 15 minutes until cheese is browned and bubbling. I used Italian flavored panko crumbs. If you cannot find these, I recommend seasoning regular panko bread crumbs with a little salt, pepper, and oregano.